Our teachers, education professionals and family violence experts are delivering real results on the ground in their communities every single day – despite chronic underfunding and an ad hoc policy approach based on three year election cycles. ” We acknowledge the strength of culture and kinship, and those strong bonds that can helpshape higher expectations and better outcomes. I want to pay tribute in particular to the Indigenous women who demonstrate that strength every day. The mums and the grandmas and aunties and sisters, who never give up. We must ensure that the education system, and all those in it, believe in the dreams of our young people. That we support each student and lift them up, and give them every opportunity to get the most out of their education. 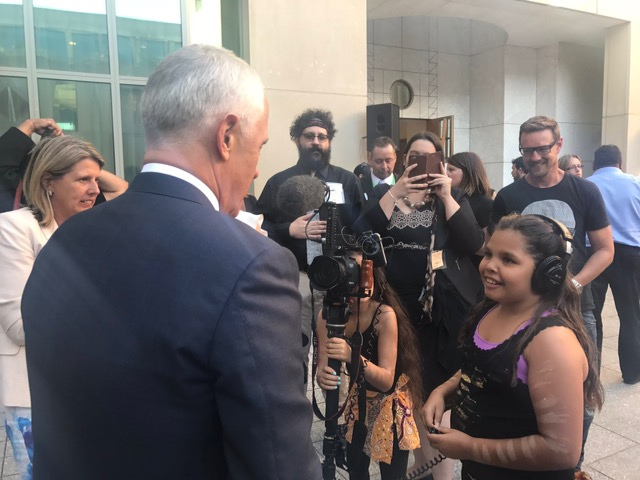 Aboriginal leaders seek new relationship with government through historic Redfern Statement Australia’s leading Aboriginal and Torres Strait Islander peaks will today demand a new relationship with government as they deliver the historic Redfern Statement direct to the Prime Minister at Parliament House. Peoples and non-Indigenous Australians by working with them as genuine partners. National Congress of Australia’s First People’s co-chair Mr Rod Little said: “After 25 years, eight Federal election cycles, seven Prime Ministers, eight Ministers for Indigenous Affairs, 400 recommendations, and countless policies, policy changes, reports, funding promises and funding cuts, it’s time to draw a line in the sand. 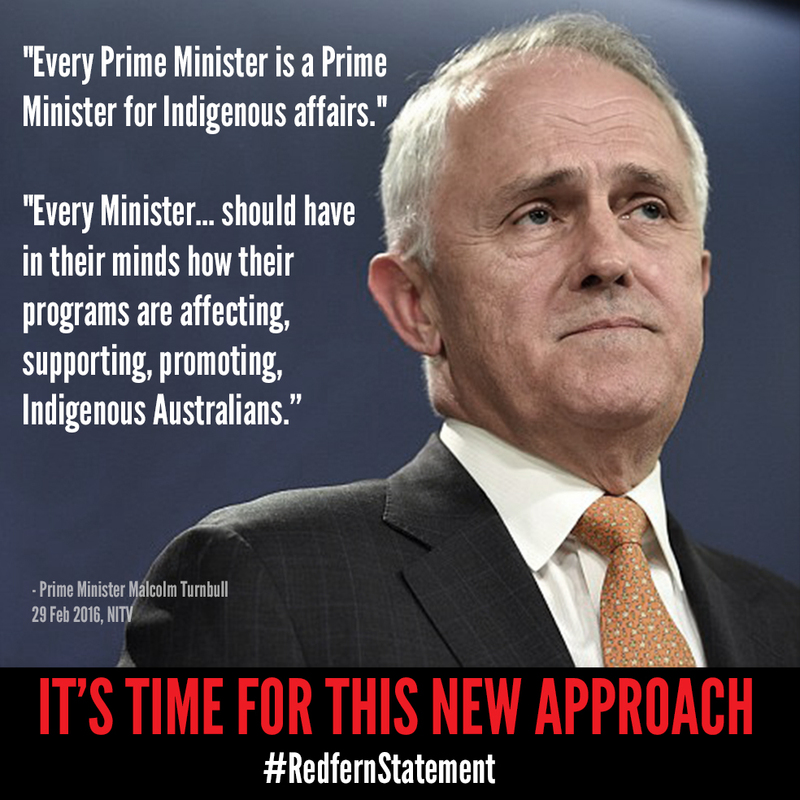 The Redfern Statement was released during last year’s Federal Election campaign by Aboriginal and Torres Strait Islander leaders from health, justice, children and families, disability, and family violence prevention sectors. The statement calls for changes across these sectors through structured engagement with Aboriginal and Torres Strait Islander people, and is supported by more than 30 major mainstream organisations, including the Australian Medical Association and Law Council. • Implementation of recommendations by the Council for Aboriginal Reconciliation – including an agreement-making framework (treaty) and constitutional reform. The Healing Foundation, and The National Health Leadership Forum (NHLF). The Statement also has the overarching support of The Change the Record Coalition; Close the Gap Steering Committee, and Family Matters campaigns. Yoonggu gulanyin ngalawiri, dhunayi, Ngoonawal dhowrrra. Today we are meeting together on Ngunnawal country and we acknowledge and pay our respects to their elders. I acknowledge and pay my deep respects to your people, the Ngunnawal people, who as you said Tina, have walked these lands, and met on these lands, forever, for time beyond our imagination, for time out of mind. I extend our respects to all of your elders past and present and to the future elders, to the young dancers tonight, and to all our First Australian People and their elders, including of course, all of the outstanding achievers and role models here today. Of course I want to acknowledge and welcome all of my ministerial and parliamentarycolleagues, especially Nigel Scullion, the Minister for Indigenous Affairs and of course Ken Wyatt, Minister for Aged Care and Indigenous Health and – as you know – the first Indigenous Australian to be a Minister in a Commonwealth Government. Now today is the 9th anniversary of the National Apology to the Stolen Generations. We acknowledge today, as we did in the House earlier, the loss, the grief, and the heartache past policies created for our First Australians. But despite these injustices and that trauma, you and your people have shown a courage and resilience which is extraordinary. Tonight, we acknowledge the remarkable lives of so many Aboriginal and Torres Strait Islander Australians, who are thriving and succeeding in their chosen fields. Your stories are not deficit, but of surplus; not of despondency but of a relentless and determined optimism. You lead and you inspire by your example. So many lives of achievement. Rishelle Hume, a senior human resources consultant at Chevron, whose work supporting Aboriginal people to grow in their careers spans two decades and many industries. Cherisse Buzzacott, an Arrente woman who is helping women give birth safely and providing vital midwifery support to women in remote parts of the Northern Territory. Or the Kongs—a family of firsts. Marilyn and Marlene were the first Indigenous medical graduates at Sydney University. Marlene became a GP and public health expert; Marilyn became the first Indigenous obstetrician and their brother Kelvin, the first Indigenous surgeon in Australia. Kelvin and his wife are here with us this evening. Another young doctor, Vinka Barunga, is now the first Indigenous doctor in Derby, a town two hours out of Broome, where she grew up swimming, fishing and playing with a plastic stethoscope. She’s a proud Worora woman, going back to her community. She would have been here tonight, but work has called her away. We also have with us Dr Cass Hunter, Mibu Fischer, and Karlie Noon—all working at CSIRO on research that impacts Indigenous communities. Karlie has just won a scholarship, one of two new CSIRO Aboriginal and Torres Strait Islander scholarships, to undertake postgraduate studies in STEM subjects. Congratulations, Karlie. Tanya Denning, a talented journalist and producer now managing the National Indigenous Television station that celebrates Indigenous Culture, voices and storytelling. And so many others; people working caring for country, in health, social services,education, science, technology, law, the arts, politics, public service, defence and much more. We acknowledge the strength of culture and kinship, and those strong bonds that can helpshape higher expectations and better outcomes. I know that you would all agree that a solid education is the surest way to get from the firstIndigenous doctor, to the 500th and then the 5,000th. To make sure that in years to come, we’re not talking about one or two hundred Indigenous lawyers or accountants, but thousands of them. So I want to thank all the organisations, some of whom are here tonight, for their investment in the dreams of these young people: Aurora Foundation, the Australian Indigenous Mentoring Experience, Career Trackers, AFL Cape York House, and many more, but too many to name. Indigenous students enrolling in higher education nearly doubled. The higher the level of education, the smaller the gap between Indigenous and non- Indigenous employment. For tertiary-educated Indigenous people, there is no gap. There is no gap. We are making progress, and you are part of it. And each of you are Ambassadors for change. Your determination and resilience is a demonstration to others that through hard work, anything is possible. Your stories are vitally important, your example is vitally important in creating that change. Indigenous life is extraordinarily diverse and extraordinarily rich. It unfolds in the remotest parts of our nation as well as in the heart of our busiest cities and suburbs; far away in the Tiwi Islands, right here in the centre of Government, in the bush and on the coast. It encompasses extraordinary talent, vision and determination. So Tonight I want to challenge all those present, and people right across Australia to tell your stories. To widen our lens. To focus the attention of our nation, on your hard work and your achievements. We want to have a nation where our indigenous children are limited only by their imagination. To show Indigenous children from Shepparton to the Tiwi Islands, from Redfern to Alice Springs, that they can be anything they set their mind to. That little girl can be anything she sets her mind to, Tina. That’s the dream, that’s the goal. So that being Aboriginal and Torres Strait Islander means to be successful; to achieve, to have big dreams and high hopes, and to draw strength from your identity as an Indigenous man or woman in this great country. There is a room full of role models right here. When we include the stories like those we honour tonight, we shine a light on the richness and diversity of our First Australians. We light, you light, the way for others to follow. Indigenous Australian success stories to come. the very wise Ken Wyatt, Minister for Aged Care, Minister for Indigenous Health, the first Indigenous Member of the House of Representatives and first Indigenous Minister in a Commonwealth Government.